On this page, the effect of a decayed wait is shown. 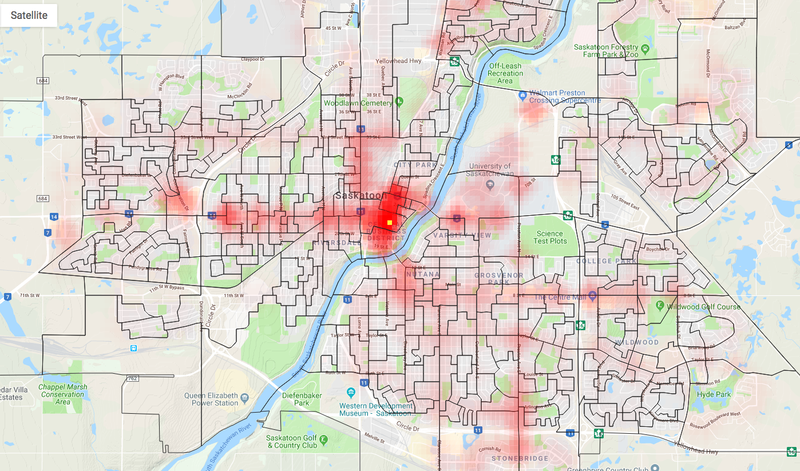 Heatmaps were generated using the BRT dataset, 400m diamond buffers, and grid distance with dpass=250. 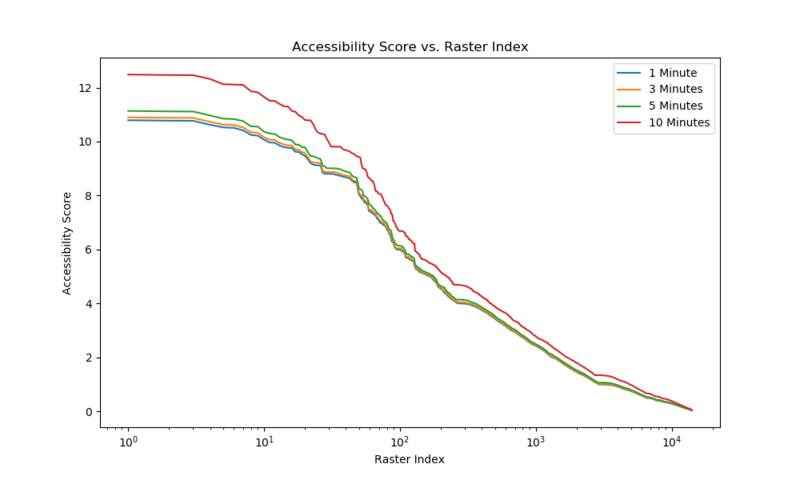 A higher acceptable wait time (mpass) increases the overall scores and this is shown in the plot above. The curves appear to have the same shape, as if they were just multiplied by a scaling factor. If that were the case, that would be equivalent to just increasing the overall score everywhere on the heatmap. But in fact the effect of wait time is NOT the same everywhere on the map, and the curves in the plot above have slightly different shapes. In the image below, the heatmap with mpass = 1 is shown. Below that is the heatmap for mpass = 10. The two heatmaps look similar. 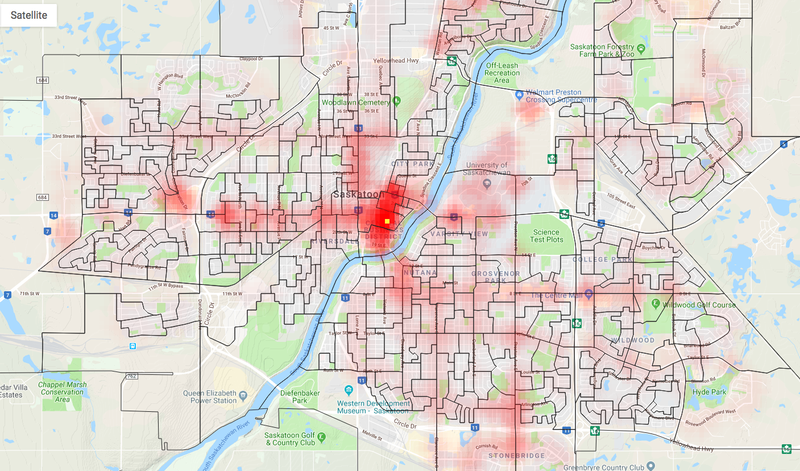 But, when the difference between the heatmaps is computed as a percentage, the effect of the wait time decay on the heatmap becomes very obvious. This is shown in the third plot below. Above Heatmap with mpass = 10 minutes. Above Change between heatmaps with mpass=10 and mpass=1, plotted as a percentage. The results are very interesting. It looks almost like a negative of the actual heatmaps. This is because the scores do not increase as much in areas with high frequency service, such as along the BRT lines. But, in outlying areas with less frequent service, the score improves more when users are willing to wait. 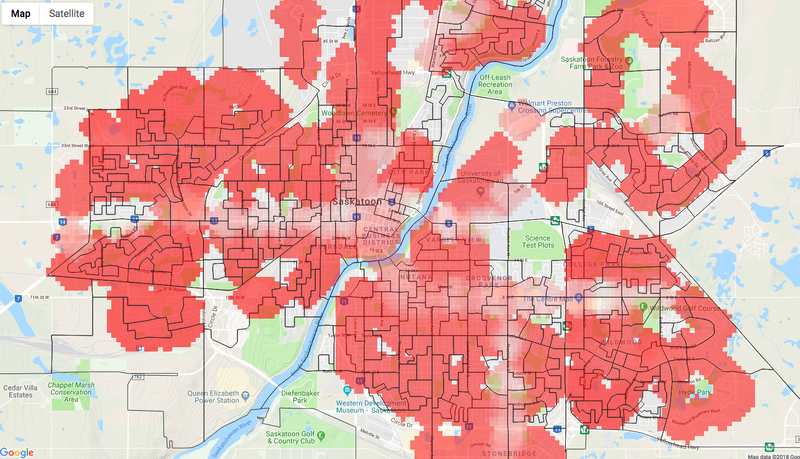 Keep in mind, however, that although the scores increase at a higher percentage in the outlying areas, they are still lower overall, as shown in the two heatmaps previous to the one above.